Champions Trophy 2013 is starting tomorrow Thursday 6th June in England. During Champions Trophy Group Matches Pakistan and India will also play a match on 15th June that will be very important match for both sides for qualifying to next round specially if any of these team failed to perform well in earlier matches. There will be many Important players for both sides in this big match which can help their teams to win but Pakistani opener Nasir Jamshed can prove to be a big danger for India. 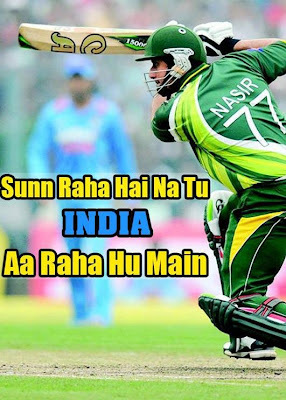 Nasir Jamshed has played 4 ODI matches against India and scored centuries in three matches. Indian bowlers will be trying hard to get his wicket early to restrict Pakistan to a low total otherwise another century from Jamshed can create trouble for India. Indian team will also be hoping for good performance from their young talented Batsman Virat Kohli. Pakistan has got a very good bowling unit so it will be interesting to see how strong Indian battling line faces strong Pakistani bowling.